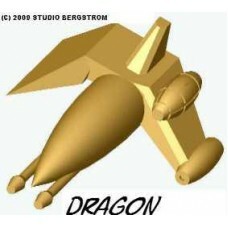 The Dragon scout-ships are a formidable asymmetrical little fighter. These short range scouts can increase the accuracy of capital ship main guns by providing better targeting data, while providing a minimal footprint in space to pinpoint their own location. These are favored by space pirates because of their stealth, but only when they can capture them intact to turn back upon their previous owners. Do not be fooled by their diminutive appearance; these Dragons have teeth! They are 5/16”L x ¼”W x 1/8”H (8mm x 6mm x 3mm), and 6 packs include pins and 1" hex Versi-Base (tm).